Regularly at Living Peace Yoga (Toronto) and various venues around Newcastle. See Events page for upcoming event. The meditation and spiritual practice of Kirtan is an uplifting and beneficial technique to focus the mind and activate the spiritual heart. Kirtan is the repetition of a song/chant dedicated to praising, glorifying and connecting with the divine. Kirtan is most often sung in a call and response style, with the leader chanting a divine phrase and the group responding in unison. Kirtan is a very simple and powerful way to meditate. It is joyful, calming and invigorating as the live music and mantras allow you to flow with the melody and rhythm. It is a united event where the leaders of the chant and the participants merge as one. It really doesn’t matter if you can sing or not…the sound comes from the heart, not the vocal chords! Come along and experience this beautiful practice of kirtan. No bookings required…just turn up and sing! 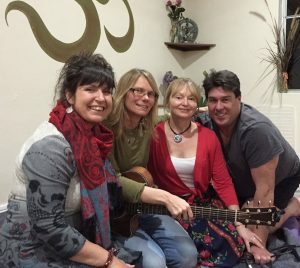 The members of Living Peace Kirtan include Ginny Clarke on harmonium and vocals, Greg Clarke on table and words of wisdom, Angelique Pratten on vocals and harmonium and Cass Campbell on guitar. Their love of music and singing the divine names shines through during their kirtan.